i can't resist buying blueberries when they're in season. we usually wind up adding them to a fruit salad, but i really felt like baking this year. the fresh blueberry container from costco held about 6 cups, so i made two of these cakes (one for home, one for the office, and put 2 cups of blueberries in the freezer. i found this recipe online at the southeast texas honey company site. the cake is nice and moist, not too sweet, really nice. next time i'll cut the lemon juice and zest in half though -- the lemon flavor almost overpowered the blueberries. this is one to try if you can't resist this year's blueberries. 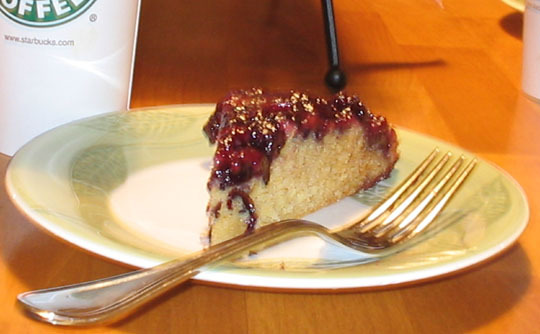 Place blueberries in bottom of greased 9-inch round cake pan; distribute evenly. Sprinkle with flour; drizzle with honey and lemon juice. Set aside. In a small bowl, combine flour, baking powder, baking soda and salt; set aside. In a medium bowl, combine honey, eggs, milk, lemon juice, lemon peel and vanilla; beat with folk until well mixed. Add flour mixture; mix well. Stir in melted butter; mix well. Pour batter over blueberries in pan; spread to cover evenly. Bake at 350°F for 30 to 35 minutes, or until toothpick inserted in center of cake comes out clean. Cool in pan on wire rack 10 minutes. Invert cake onto large plate; cool. You can make that the next time I come out to visit. It looks YUMMY! I just visit this blog to see the pictures. This looks YUMMY!!!!!!!!! !